Having lived & breathed Fashion for a number of years as a young woman, I consider the métiers of Fashion, Art & Design as part of my roots. Lately, since I’m feeling a bit rootless with this change of season and all of the planetary influences, I have been researching through the new season of ‘la mode’ just to shift the view, the perspective. I thought that I would take a moment to recognize a couple of well-known people whom I consider ‘Influencers’ and icons, at least in my history of watching trends and my love of fashion, beauty, placement, and styling. To begin, Grace Coddington, is the end all and be all, the Queen Elizabeth I of cinematic fashion editing and styling. For 30 years she has modeled and styled for the likes of Vogue UK & US. I have followed her since my days at FIT. Her settings, some of them, fairytale-like, speak to the romantic in me. For many, she was and is one of the most influential women in the concept of design, creating many of the most beautiful images for print. Still a living legend, and now a Creative Partner with TIffany’s as one of her independent projects, I found her recent foray into video interviewing refreshing and off the cuff. 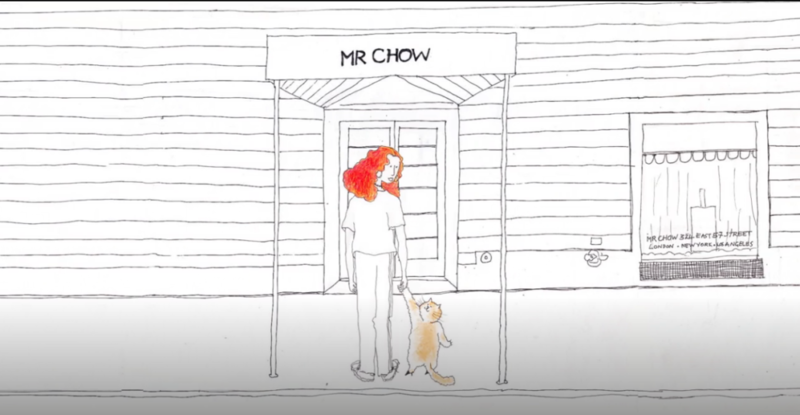 Held at the infamous Mr. Chows restaurant (he was one of her husbands when she was younger), her shyness, yet wealth of knowledge gives us another view of the iconic symbols in the industry. Here she is speaking off the cuff, with friends & acquaintances, some of the ‘Influencers’ in the world of design, film, and fashion. This is the link to the interview with her equally famous cohort at Vogue, Anna Wintour, the editor-in-chief of Vogue a well as the artistic director for Condé Nast. The rest of the interviews which are just as interesting can be found on M2MTV. When I was a younger woman, I went from going to finishing school to studying design to a bit of modeling to retail and merchandising, and then I walked away. I see Grace’s images and dedication, her talent, her ability to walk through her fear before every shoot, and sometimes I wonder what would have happened if I had a bit more courage at that time…but I chose another circuitous path and have incorporated this base and love of colour, design, and form along with my other formations in the realm of the esoteric, the alternative and healing arts into my practice of Feng Shui and Redesign. Thus, I get to use this whole ‘paint box/tool kit’, in very interesting and unusual ways. I love what I do, plus I have always kept my toe in the water with my occasional styling for friends and clients. If you like image and beauty, and gorgeous photographs from some of the worlds very best, Grace is your gal, and there are many ways to get a taste of the world of which she was a part! If you are intrigued and want to know more, there are several books in print and one with illustrations of incorrigible cats written with her longtime partner Didier Malige. for kitty lovers out there – she adores them! 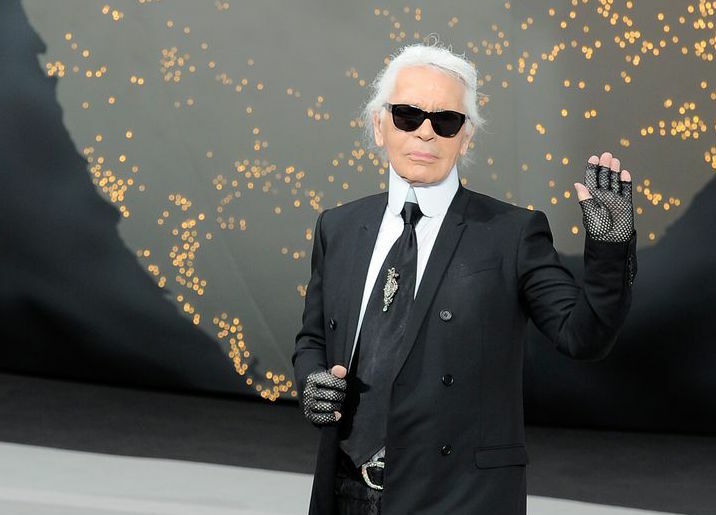 I could not write this piece without paying a tribute to the Grand Kaiser of fashion, Karl Lagerfeld who was the designer for three famous fashion houses at the time of his death: Chanel, Fendi, and his own label. 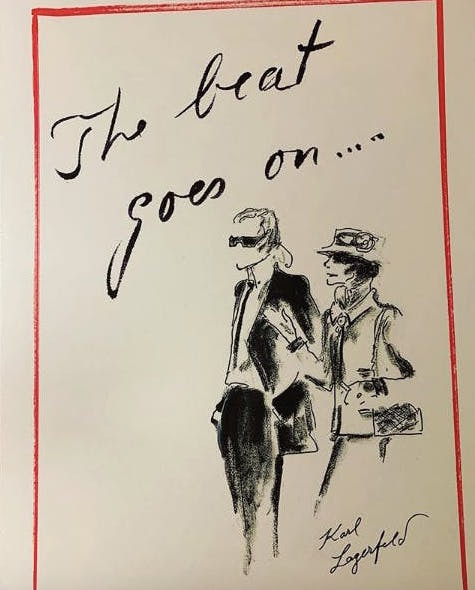 He took Chanel from a languishing house to one of the most marketed logos in fashion history, from workout pants to the iconic ‘Chanel’ jackets, he had the famous ‘CC’ initials and his name everywhere. 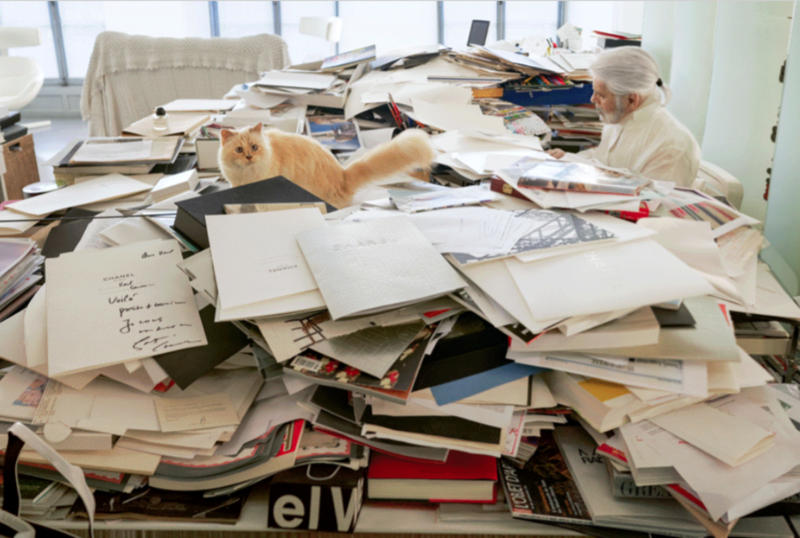 A true Renaissance man, not only did he draw & design, but he created interiors, DJ’ed and chose the music for his shows, made his cat, ‘Choupette’, as equally an iconic figure as himself with her own beauty contracts and Instagram feed. And for those Marie Kondo lovers, I adore this image of him at his desk in the midst of his research and correspondence under a deluge of paper. It certainly didn’t stop him from being one of the top creators of the last century. Something to think about for all those extremists out there, being someone with Libra Rising, I have to have balance and my office is lovely, but I have a pile of research to my left in the Knowledge & Career guas and on my computer. Lagerfeld chose David Bowie’s hit “We Could Be Heroes” to blare through the venue of Fendi and Chanel for his finale, perhaps he had an omen, as he was truly one of the last of his kind.